Would you believe it was the warmest May on record? You wouldn’t know it from recent weather along the West Coast, but the month of May this year was the warmest May ever recorded across the globe, according to NOAA’s National Climatic Data Center. 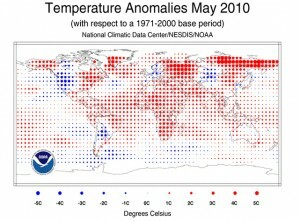 Worldwide, the average land temperature for May was 1.87 degrees F. higher than May’s long-term average of 52 degrees. That makes it the warmest May ever recorded. On the ocean, meanwhile, surface temperatures averaged .99 degree F. above the average of 61.3 degrees. That makes it the second warmest May on record, behind only May of 1998. In Western Washington, we had a cool, wet May — the third coolest in the last 25 years, as Kitsap Sun reporter Ed Friedrich reported at the beginning of the month. That just goes to show again that regional weather may have little bearing on global climate. 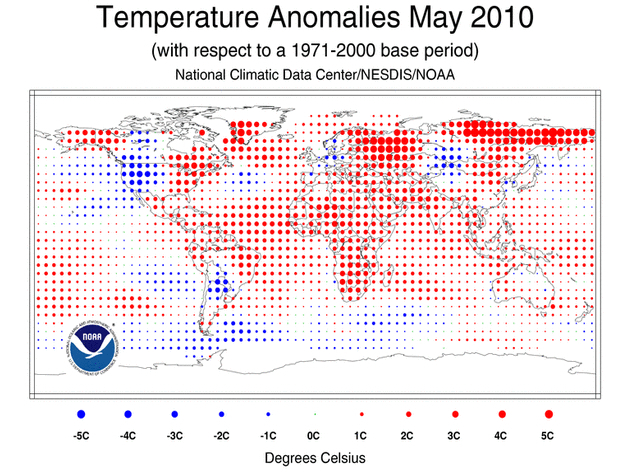 According to NCDC, warm temperatures in May were present over most of the world’s land masses — the warmest areas being Eastern North America, Eastern Brazil, Eastern Europe, Southern Asia, Eastern Russia and Equatorial Africa. Numerous locations in Ontario, Canada, had their warmest May on record. Besides the West Coast, cool areas in May included Northern Argentina, Interior Asia and Western Europe. Germany had its coolest May since 1991 and its 12th coolest May on record. The period of March through May also brought record highs for the combined land and ocean surface temperatures across the Earth. See the news release for details. Arctic sea ice was 3.7 percent below the 1979-2000 average and melted 50 percent faster than the average May melting rate, according to the National Snow and Ice Data Center. Antarctic sea ice was 7.3 percent above the 1979-2000 average, resulting in the fourth largest extent on record for the month of May.